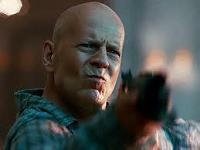 The fifth film in the Die Hard series, A Good Day to Die Hard hasn't been especially well received, although the event of Bruce Willis returning to his most famous role, John McClane, did generate a deal of attention. This time, the tough New York cop travels to Moscow to help out his son 'Jack' (Jai Courtney) – who, it turns out, is a top secret CIA agent working a dangerous mission. When father and son cross paths, they must team up to stop nefarious terrorists from committing deadly destruction – yes, John is at the wrong place at the wrong time yet again! Willis isn't the only one returning to the franchise. Composer Marco Beltrami also returns to write the music. It's his second Die Hard score following Live Free or Die Hard in 2007, a mantle he took over from original composer Michael Kamen who tragically passed away in 2003. Kamen established a very witty and distinctive sound for the first three Die Hard movies, scores that often seemed to skirt knowing self-parody with their incorporation of quirky elements into the action setting (Christmas sleigh bells in the first movie). Kamen also frequently interpolated classical music into the scores, the most famous example being Beethoven's Ninth in the first film – an idea that Beltrami respectfully, though briefly, reprises here. Although Live Free or Die Hard was a perfectly competent modern-day action score, it lacked a distinct identity of its own – a surprise given that Beltrami is one of the most inventive (not to mention underrated) of film composers. Just think of his own take on Ennio Morricone's classic scores in the remake of 3:10 to Yuma, the romance/horror blend of Mimic or the Hawaiian chants of 2011's Soul Surfer. However, anonymity is problem that Beltrami more than sorts out here – A Good Day to Die Hard has lots more going on, its frequent throwbacks to Kamen for one. It's a selfless and honourable thing for Beltrami to incorporate the former composer's work into his own and he does it with real aplomb, beginning with the aforementioned incorporation of Beethoven at the start of the opening track "Yuri Says". The composer also introduces the pensive strings familiar from Kamen's suspenseful work on the series, which melds brilliantly with Beltrami's own cutting-edge blend of percussion, electronics and harsh horn blasts, the likes of which were heard in the Scream movies. Right from the off then, it's clear that Beltrami is working hard to incorporate Kamen's original motifs with his own voice. "Getting Yuri to the Van" incorporates a sense of tick-tock urgency into the Kamen-esque musical wash before a strident sense of rhythmic power takes over. "Jack Makes the Call" and "Everyone to the Courthouse" both foreground the synthetic element – something that's much more pronounced in this particular Die Hard score than any other. However, Beltrami pulls it off with tasteful aplomb, especially when he mixes it with a Russian instrument called a Balalaika to signify the film's setting. The former track also introduces a hooting harmonica, presumably to indicate McClane's fish-out-of-water persona – a wickedly witty touch! "Court Adjoined" explodes with the first proper action track, Beltrami's crisply rhythmic and dynamic action style getting a brilliant airing. The fluttering high-end woodwind effects from his horror scores are another nice touch. However, the two "Truckzilla" tracks that follow, plus "Yippee Ki Yay, Mother Russia!" are even better – mind-blowingly complex action pieces that highlight Beltrami's fantastic abilities in the action arena. Choppy strings pulsate behind stark brass work, synths and assembled timpani effects to create a real sense of danger. When Kamen's material is once again woven in, it leaves listeners in no doubt as to which series this music belongs to. "Father and Son" then calms things down a bit and is a genuine surprise – a theme of real warmth and compassion in a Die Hard score. Themes weren't something that Kamen focused on in his original scores and Beltrami's work on the fourth film also steered clear, so to hear material like this is a delight. Needless to say the calm doesn't last long – "To the Safe House" brings in the percussion once again, "Regroup" is a somewhat tense piece before "Leaving the Safe House" and "Getting to the Dance Floor" erupt in more thrilling, orchestral-electronic action. The latter track even introduces a solemn string line for a few bars. "Too Many Kolbasas on the Dance Floor" is perhaps the broodiest track on the album, the strings gradually wailing away and increasing in pitch in the manner of Kamen's most suspenseful work on the franchise. There's also a subtle reprisal of "Gruber's Arrival" from the first Die Hard. "What's so Funny?" and "McClanes Get the Bird" move back towards an action-oriented direction with Beltrami's brilliantly orchestrated brass work (courtesy of regular collaborator Pete Anthony) getting another dynamic blow-out. The banging anvils in the latter track add more texture to the frantic arrangements. "Scumbags" is another moody track before a dramatic statement of Kamen's material opens "Chernobyl" – taking us to a different location and therefore introducing us to a different tone in the music, with a low Slavic choir, balalaika and carefully gauged electronics possessing an suitably haunted quality. "Into the Vault" continues with tense electronics before a menacing statement of the dark villain's theme occurs in "Rubbed Out at the Spa". But these are mere precursors to the terrific three track passage of action that concludes the score. From "Sunshine Shootout" through "Get to the Choppa!" (Arnie reference?) and "Chopper Takedown", Beltrami uses every trick and technique in the book to wring maximum excitement out of the orchestra. One especially terrific edition is the use of the 'falling' brass effect so brilliantly used by Kamen for Hans Gruber's death in the first Die Hard – it's used wonderfully here to create a palpable sense of tension. After that frantic section, Beltrami is astute enough to end with a glorious rendition of the new McClane theme in "It's Hard to Kill a McClane" – quite possibly the most heroic musical statement heard in any Die Hard score to date. The noble brass and string tones call to mind another action master – Jerry Goldsmith, who was once Beltrami's mentor. But the score isn't done yet! As if to prove that he had his tongue firmly planted in cheek throughout the making of the score, Beltrami presents an enjoyably infectious "Triple Vodka Rhapsody" at the end of the score, one with definite Russian associations. The decision to place it at the end of the album is curious though effective one – perhaps the composer realised that the listener might be wrung out by the end of the score and placed it there as a comedown of sorts? Either way, it's a charming showcase of Beltrami's ethnically sensitive writing – and the final track "McClane's Brain" is a wacky showcase of his rarely heard comical writing! A deranged, amusing quasi-rhapsody that re-introduces the harmonica motif for McClane, it's an enjoyably off the wall piece for a score that has, for the most part, been so serious! 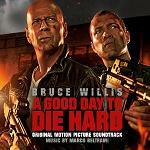 There are just enough fresh touches in the score A Good Day to Die Hard to make it stand out from the pack. It might be tempting to write it off as anonymous noise (and indeed Kamen's original works remain sadly underrated for those same reasons) – but there are several enjoyably witty flourishes that help lift Marco Beltrami's work. The occasional location and character specific pieces, not to mention the consistent loyalty to the sound that Kamen laid down in the original movies, make it a much more varied listen than Live Free or Die Hard, and the score is once again proof that Beltrami is one of the finest action composers in the business. It's a shame that the score is attached to a film that has been greeted with less than enthusiastic responses from Die Hard fans. Fingers crossed Beltrami's enjoyable work won't also be pulled through the mud – it's an entertainingly tongue-in-cheek score from one of Hollywood's most overlooked composers. If not quite on the level of Kamen's Die Hard or Die Hard 2, it's not far away. "A Good Day to Die Hard" is available at Amazon.co.uk and Amazon.com. Yippee Kay Yay, Mother Russia!